NPCs have come a long way since wooden quest-givers or rigid avatars on tracks behind you with a gun (Fallout 3 and to some degree New Vegas). In Fallout 4 we get all kinds of companions from robots to super mutants. I was drawn to Nick Valentine immediately after a quick read of the wiki as the game was coming out, but I ended up finding a lot of depth in the character I hadn’t expected. In my opinion he’s the most complex and interesting of the companions. Keep reading and maybe you’ll think so, too. Note that although I’ll try to avoid mentioning big plot points in the game, some spoilers about Nick’s backstory are to follow. Keep reading if you’ve played through the game already or don’t care about minor spoilers. That’s actually a bit more complicated to answer than it seems. The simple answer is that he’s a synth (android) detective you meet along the main quest line of the game while he’s in the middle of working a case. After you help him, he offers to lend his expertise to your own quest. But under the surface of this face that bears the cruelty of the Commonwealth wasteland there’s something more going on. As you build affinity with him (gain approval through travels) he’ll tell you about his early experiences in the Commonwealth. Namely, that he is a discarded prototype from the Institute with the memories of a pre-war detective. 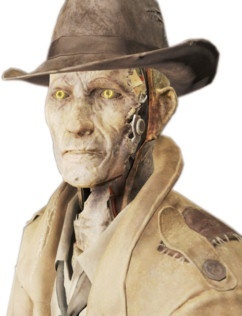 When he first awoke in the Commonwealth he thought he still was the original Nick Valentine, which must have created an understandable panic about being in a robot body in a post-apocalyptic wasteland all of a sudden. It was moments like that where I realized that he’s probably the only character in the game that can appreciate how the player character really feels about his/her own situation. Like the player, he has all these memories of a pre-war life that don’t fit in the wasteland, causing a deserved amount of questions of what that means and who they each really are now. Both had someone important taken from them and feel powerless to resolve that (player’s son and Nick’s fiancee), and both were thrust into a new and violent world outside anything they’ve known. When you complete the last of Nick’s personal quests, he has a moment where he feels lost. The last remnants of pre-war Nick Valentine are removed from the world. The last people that knew him are finally gone, and the last wishes of the pre-war man are fulfilled. What’s left is a robot full of another man’s memories. But is that it? He seems to content himself on the idea that the life he’s creating now will have to be enough, that he doesn’t have to live in the shadow of a man whose memories he has, but is not. Is Nick still Nick Valentine? The player can reassure him by saying he’s doing a good job of making a life in the wastes and is still a good man. Something I wished you could pose to him, however, is the idea that he is still Nick Valentine. Rather than accepting that he doesn’t have to live as a “cheap imitation” of Nick, what if he could accept that he IS Nick Valentine? Bear with me on this one. We see ghouls in the game all the time. Many of them were regular people when the bombs dropped and became what they are now. Their memories are intact, as are their personalities. Surely a ghoul named Bob doesn’t think of himself as some other being simply because he looks different in the mirror these days, right? Hell, even humans right now aren’t the people they were 5 years ago. Cells in our bodies constantly die and are reborn, which is covered brilliantly in Vsauce’s video on this topic. Every 5 years, “basically every atom in your body has been replaced.” You’re still you, right? Even if at a cellular level basically none of who you were exists today? We can define our consciousness as the whole of our mental processes we experience the world through. If our consciousness, above all other things, is what makes us “us”, then couldn’t we continue to be us in a different body if the consciousness is the same? At what point of physical change do we stop being us? If I’m in a horrific accident, for example, and am both disfigured and require numerous organ transplants to survive, am I no longer me? Sure, Nick is in a mechanical body now. But everything else that made Nick Valentine who he was — his personality, his core values/motivations, his memories — are completely intact. If you talked to Nick on the phone in the present without seeing his body, you’d have every reason to believe it was the original guy. Most of the other companions have a comparatively simple reason for joining you. Piper wants to use your quest for writing material. Strong wants help on his quest for the “milk of human kindness” that he thinks will make him stronger. Cait is basically forced into your servitude. MacCready is a mercenary that joins you for caps. All Fallout 4 companions can be loyal in the sense that, if their affinity doesn’t drop too low, they won’t desert you. But there’s a difference between following you in a superficial sense and being a partner. 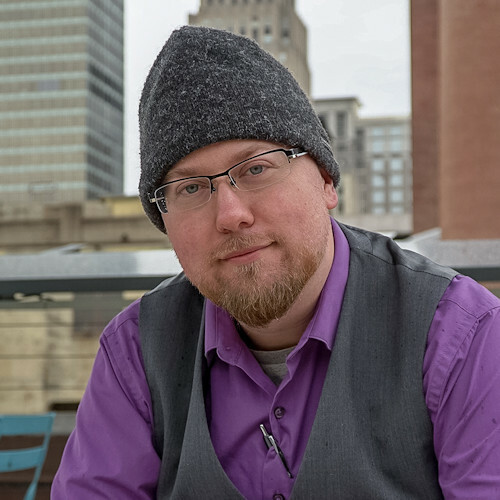 Some companions seem nonchalant or even relieved when you dismiss them, but often Nick’s comments are of mild disappointment because of the good you’re doing together. He thinks of you as a team. Like others I’ve talked to about Nick Valentine, I share a love of the noir genre. Maybe that makes me a little biased with Nick, but I think objectively it gives him a very different feel than other NPCs in the game — NPCs that are products of a post-war wasteland. There’s something old world about Nick, but in his own way he fits in this wasteland by being something it sorely needs.